Painting requests often lead me in search of things I normally might not come across. Often this makes for interesting reading and I get to paint things I may not otherwise have considered painting. Several years ago my first grandson graduated from college with a teaching degree. After teaching teens at risk, the opportunity arose to teach fourth grade English and math in South America. An offer he couldn’t resist, he was off to Ecuador for a year. After returning to Indiana he purchased his first home. It was a 100+-year-old house with lots of character. After settling in he came to visit us in Georgia. We talked about his home for a while then he asked if I would paint something for his living room. I was delighted and I asked if he had a subject in mind. 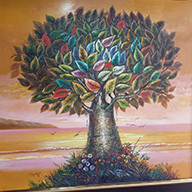 Josh had seen a painting in Ecuador of a Tree of Life and wondered if I could paint something similar. While researching I found a multitude of styles for a “Tree of Life” so I asked if he could text a photo of the one that had caught his eye. 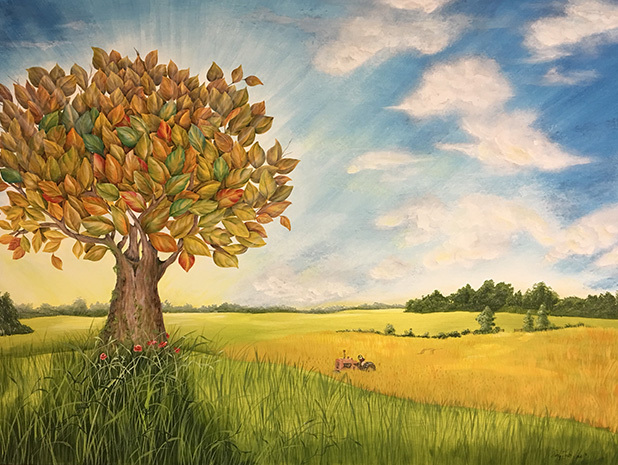 Since he needed a somewhat large painting (36″H x 48″W) I then asked if he had an idea of where his tree might be planted. A place that meant something to him and that he wouldn’t tire of seeing every day. Without hesitation, he said, “Indiana farmland would be nice.” Then I asked if there was anything he would like to see in that field, maybe something that conjures pleasant memories. His first response was, “grandpa’s tractor.” This was great direction and he didn’t think about it, he went with what first came to mind. Our first thought is seldom wrong. The painting was delivered in time for the Thanksgiving holiday in Indiana with family and friends – just a week before my shoulder surgery. The work was painful but the joy of creating a painting for my grandson far out-weighed the pain. It has taken nearly a year after surgery to get back in the studio with any regularity. It feels SO GOOD! What’s next: Grandson #2 requested a painting and the subject isn’t even close to Indiana Farmland but then he lives in Georgia. As therapeutic as Zentangle has been during my healing process, my focus has returned to painting and flowers are beckoning. I’ve learned my current physical limitations. No more than 3.5 hours before the pain begins. Limiting as it is, all the more reason I need to focus. I’m excited to be setting a regular painting schedule. It’s been a long process. Below is how my Tangling has changed in the last year or so. The addition of color was fun and the more free-flowing I got with my strokes the happier I was. Any questions – ask away in the comments section below! We had a cold spell in Southern Georgia, it even snowed! Yes, Snow! The snow stayed in the grass for a few days and the funny thing is that grass got really hard and it made a crunching noise under my paws. Ouch, ooo, ooo, ooo. It wasn’t comfy. Oh, how I miss snow. There’s a magical beauty in falling snow. But I have to tell ya, in Colorado when the sun was shining and the snow was falling it was dazzling, like falling diamonds. I remember bouncing in and out of the snow. Sometimes it was deeper than I was tall. Actually, that’s not too deep. When I got cold I would stop, raise my right front paw and mom, she is so smart, knew exactly what to do! Get me the heck into the house! The snow just makes my winter complete and so do you. Yea for snow! Miss Bella – oh my goodness…she is more adorable than ever! Wishing you Love and Joy beyond measure — you are such a blessing to everyone whose lives you have ever touched! Thank you so much for your kind words, Kate. Wishing you all the best life has to offer. Oh, how I would love to see you singing with the Colorado Springs Chorale. Reading your beautiful newsletter felt like sitting with you over a cup of tea. 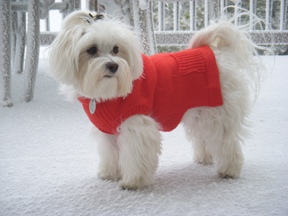 Bella is at her best…little snow-bunny! You’ve probably had more snow than we. Just this week Pikes Peak got a dusting, otherwise it has been totally bald. Good to hear the enthusiasm in your voice. Oh, I miss those cups of tea so much. So sorry to hear you haven’t had much snow that will certainly hurt the ski resorts! We always enjoy your comments! Hi Mickey! I love your tree of life and Josh’s story. We’re sad to hear your shoulder remains painful. Rubs to Bella and hugs to you. Will call you, Linda S.
Thank so much Linda, looking forward to your call. for you to be able to paint for your grandsons. Glad to see little Bella is still with you as Elway is still with us. Even though he is now 11yrs old he still acts 2! to paint all day once again. Great to hear from you, Cheryl! Glad you are enjoying the newsletter. There is a great pic of Elway on “Bella’s Buds” Pinterest board. It is such an honor to paint for my guys. It gives me hope that esthetic pleasures may not be lost in future generations. Thanks for the well wishes. You are still making beautiful creations I see! I forgot to tell you while visiting the hospital the last few weeks I saw your art in almost every room on the hospice floor. Great way to cheer the patients up! Hope you are feeling better these days. Thank you for mentioning Hospice, MH. I was humbled to have the honor of my framed art in the patient’s rooms. I also painted a mural in the room where children play while parents visit their loved ones. Hospice has amazingly compassionate people who work and volunteer there. Thank you for your lovely compliments. I am so happy to see you are visiting Jarad’s family. Your granddaughters are precious. I’m sure you will cherish the video always. You are so incredibly talented and amazing, my friend. Thanks so much, that means a lot coming from you! Not sure if my comment went through so am sending by email too. I see it looks like some of your other commenters had issues too, since you had to post them yourself. How thrilled I am, Mickey, to know you’re back in the studio more regularly and for longer periods of time. I am amazed at the creative work you did while you were mobility-challenged — what a role model for the rest of us to know we can adapt to bad situations. I loved hearing the story behind the art for the stunning piece you did for your grandson. 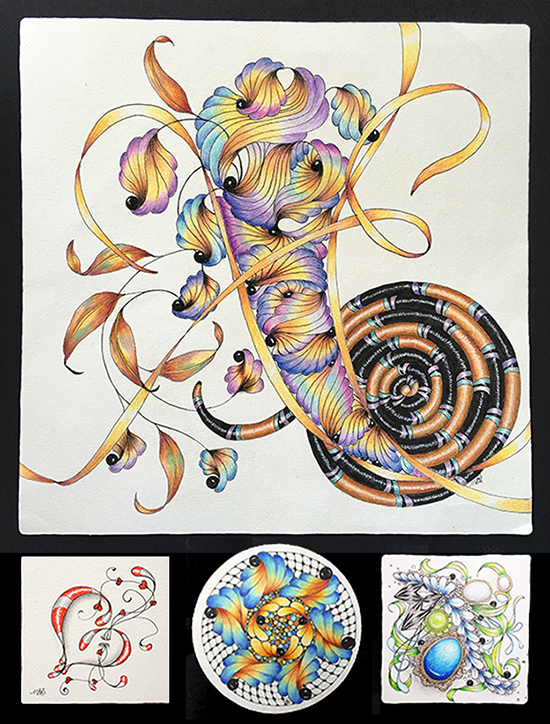 Besides being interesting, it is a beautiful illustration of how a talented artist can collaborate with their clients who commission work to produce a finished product that is so much richer than if their client didn’t contribute to the process. Can’t wait to hear more from you! I really appreciate you following my newsletter and commenting. The recovery progress has been slow but it is steadily improving. I’m good with that. A few backslides along the way but as I mentioned I am learning my limitations. A lot of planning went into painting murals. I learned so much about listening to clients. It isn’t like they could take the mural down and put it in another room if they tired of it. There were clients who didn’t have an opinion about the theme so I painted what looked best with their decor and/or the views from there home. So much more to art than painting. Thanks again for your lovely comment.